Yes, playing pool can be beneficial for your health. Read on to learn about the eight benefits of playing pool that will surprise you. It’s ubiquitous in bars and pubs, regardless of your skill level or walk of life. It’s an easy way to gather some friends and have a bit of fun. But what you may not know is that playing pool actually has some health benefits as well. Don’t believe it? Here are eight surprising ways that playing billiards is actually good for you. Yup. You might not have thought it, but playing billiards does, in fact, burn calories. That’s because you spend more time walking while playing than you think. In fact, if you play for about 60 minutes while standing, you walk an average of 4,560 steps. People take an average of about 2,000 steps while walking a mile, which means you’ve walked roughly two miles in that one hour game of pool, especially if you spent most of the time standing. And that’s a big deal because there are some surprising health benefits to walking. Of course, a rousing round of pool isn’t just good for your body. It’s also good for your mind. Playing pool, really playing pool, involves quite a lot of focus. You have to be able to keep track of what you’re trying to hit, how to get there, and how each person’s move changes your strategy. That means you spend quite a lot of time paying close attention. And that ability to hone in on a goal, even if that goal is angling your cue properly, translates directly into other areas of your life. This one is perhaps the most obvious, but it’s still true: playing pool on a regular basis helps boost your hand-eye coordination. You’ve got a long, weighted stick in your hand, and you’re supposed to balance said stick in order to hit a small, heavy ball at a certain angle in order to achieve the right speed, angle, or impact to sink the ball, impact another, or chuck it across the table. All that focus and calculation won’t do much for you if you don’t have the hand-eye coordination required to execute your planning, and unless you’re playing against an exceptionally bad player, you need hand-eye coordination to win. This helps your hands perform minute tasks elsewhere, which is important for the overall health of your brain. Let’s say you just played an hourlong game of billiards. But it wasn’t a nonchalant 60 minutes. You spent that hour walking all around the table, assessing your opponent’s strategies, adjusting your strategies as the game changed, thinking about the best possible targets, contemplated the timing of moves, and reflected on whether to play offense or defense. Oh, and you spent about half that time waiting for the other player to make their moves. Patience, as they say, is a virtue. That’s true of life and of billiards. Have you caught onto a running trend here? If so, congratulations: you’re textbook evidence that playing pool helps boost your critical thinking skills. All that time you spent waiting and calculating moves is vital time if you know how to use it. It’s your chance to think and analyze your opponent and the table. If you’re a pro, you’re actively looking at what your opponent is doing, where they’re standing, what they’re targeting, and how that move (successful or not) affects your game. That, my friend, is what we call critical thinking skills, which are vital for success in your job, your relationships, and life in general. However, that critical thinking doesn’t happen in a vacuum. After all, you’re playing a game against another person whose moves throughout the game will change your strategy options. This means your critical thinking and planning won’t help you if you don’t know how to respond to changes on the table. This teaches you how to assess and respond quickly and effectively, and it’s a skill that will serve you well in many more stressful situations than a basic pool game (like if someone got injured and needed your help). Real talk: the pool isn’t listed as a sport by accident. Sure, it’s not as active like running or swimming or even yoga, but it does involve coordinated, controlled use of your muscles. Throughout the game, you have to bend over and twist while using your hands and arms in a controlled fashion to move your cue. Over time, this will create continual low-level conditioning in the muscles of your back, hips, and legs. 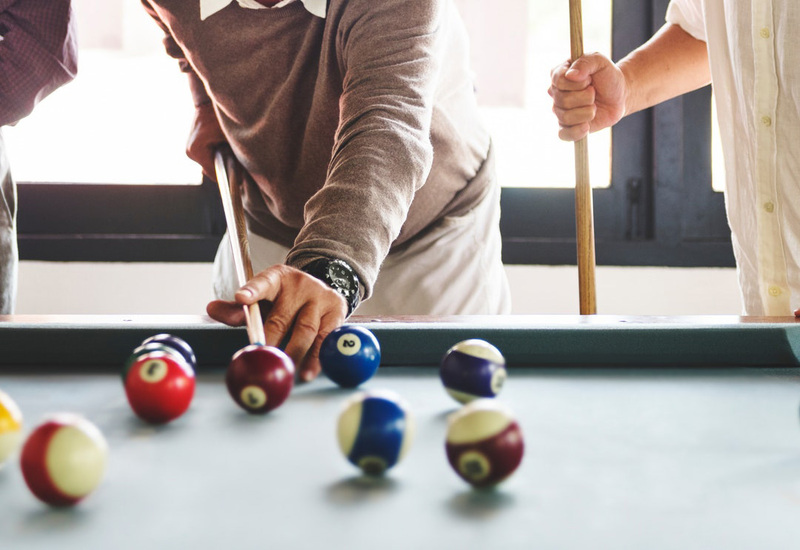 Finally, and perhaps most importantly, playing billiards is a great way to strengthen bonds with your friends and family. Sure it’s a game of strategy and finesse, but it’s also… well, a game. And any game is an opportunity to play and have fun together, teaching you to play well with each other, engage in the spirit of good fun, and think while still having a good time. It teaches you how to lose (and win) gracefully, and how to roll with the punches. It reminds you of how much you enjoy spending time with your loved ones, even when you’re trying to beat each other in a game. And that’s important for strengthening bonds. Plus, if you have your own pool table, you can turn a game of pool into an ongoing family tradition. If you’re in the market for one, this site is a great place to start. So, what are you waiting for? Gather your friends and hop to playing pool! For more tips on working out, having fun, and living your best life, check out our blog for more posts like these 10 muscle facts you need to know to get ripped or these five great benefits of boxing.